I’ve had the idea in my head since December; who makes the best burger in Jackson? 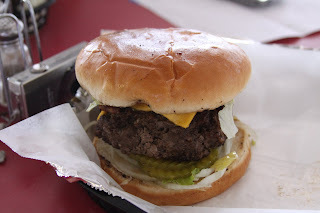 Sure, the Jackson Free Press had already declared Cool Al’s to have the best burger and fries in 2007, but after reading their write up, I was left wanting. I originally pitched the idea to Joseph in January, and he was enthusiastic, but the quest never materialized. So, in early May, I tried the idea on my webmaster Sam and he was all for it. Granted there had been a few changes in that 5 or so months. Instead of searching for the best burger in Jackson, I wanted to know who made the best bacon cheeseburger. A burger is all well and good, but there’s just something about the allure of a quality bun, ground beef, cheese and bacon all working in perfect artery clogging, heart stopping synergy. 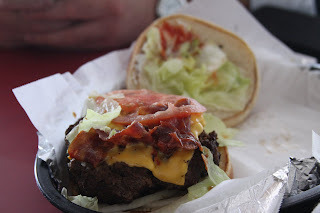 So last week we began our epic quest to find the best bacon cheeseburger in Jackson, and where better to start than the Jackson Free Press’ high water mark, Cool Al’s. 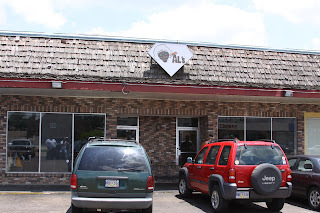 As soon as you walk in, you understand that Cool Al’s is the definition of a greasy hole in the wall. I learned that point as soon as I started slipping on the constantly greasy floor. Nevertheless, this is a Jackson institution and I’m here for the food not the floor. 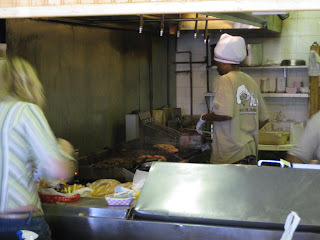 A nice feature to Cool Al’s is that all the burgers are made to order. So after placing our order for 2 bacon cheeseburgers, we got to see the grill master start to work. While cooking to order is an excellent way to enjoy a meal, it does not make for a fast lunch. However soon enough, our burgers were delivered, and I’m still amazed at the sheer size of large burger at Cool Al’s. The closet thing to a bacon cheeseburger at Cool Al’s is a Cool Al’s Classic with bacon added at a 90 cent premium. The first remark from Sam is that this is the way a burger should be, big and greasy. Unfortunately, we were both disappointed in the lack of real bacon. Who uses turkey bacon on burgers? After taking the first bite, I was disappointed at the lack of moisture in the burger, definitely a byproduct of the patty’s gigantic proportions. Another unfortunate side effect of the massive Cool Al’s burger is that the patty tends to fall apart. Sam put it best as saying the burger was a chore to eat and enjoy. When we had finished our burgers, Sam and I had a noisy debate about a points system. I try to avoid a point system because it’s extremely easy to paint yourself into a corner, but I figured I could make an exception for this search. Apparently Sam and I are pretty close to the same page. Overall, Cool Al’s has a thoroughly dressed burger with mustard, mayo, tomato, lettuce, and onions. It did seem a little strange not to add ketchup to the mix, but even with all these toppings, Cool Al’s can’t escape the simple fact that their cumbersome burgers self destruct.